I’m a true Virgo, through and through—pretty practical, intensely loyal, and I can be a bit of a perfectionist. I tend to see things as black or white, true or false—there’s not a lot of wiggle room with me. This aspect of my personality can be good or bad, depending on the situation. My students, fellow teachers, and friends know that I always want to get to the root of issues, to explore what the “why” behind things are. Understanding the “why” helps me think more clearly about the issue, and perhaps see where the other person involved is coming from. My husband doesn’t always appreciate this trait in me, since it often leads to more drawn-out arguments and discussions than perhaps need to happen, but he’s stuck with me, so there. I read the message a few times, breathing deeply while taking it in, and totally understanding how frustrating it can be to be late for something one is looking forward to. Three years into owning Kula, I like to think I’ve gotten pretty good at disconnecting from emails and messages with angry, sometimes accusatory undertones, but I’m a human being. These messages, while few and far between, can be a bit jarring, especially when you’re offering something out of pure passion and service. I’ve learned to step away from these kinds of issues and respond later with a clear head and a calm, grounded perspective. Taking the time away to think about the “why” helps me to respond with a more empathized tone, instead of my matter-of-fact Virgo voice, which I’ll admit, is not everyone’s cup of tea. I can’t help but think that if the student had done the same—waited—before messaging me, they would have handled the situation differently, chosen different words, or not sent the message at all. Communicating via screen allows for things to be said and tones to be taken that would most likely not happen if conflict conversations were done in person. Perhaps if the student knew the “why” behind our locking-up policy, they’d feel differently. I’m not suggesting they’d ever be happy that they missed class, but then they’d at least understand where the teacher was coming from, instead of assuming wrong-doing or assigning blame and expecting compensation. I saw the member the next day and mentioned that we’d missed her in class. She informed me that she must have arrived right after I’d went upstairs to begin. I thanked her for not expressing anger that she missed, and she replied, “I get it. You guys have boundaries here. If I want to be here, I have to get here on time and not show up last minute, which is expected, because I’m an adult. I think it’s healthy that you all have boundaries as a studio. Thanks.” I almost cried. As a Virgo, I don’t get choked-up often, unless animals or small children are involved. I thought about commissioning a local artist to paint her quote as a mural on one of our walls. She gets it, I thought to myself. Weeks have passed since I received the message from the late student, but I find myself mulling the situation—and others similar to it—over in my mind. How can I do a better job of letting our community know about the “why’s” behind the way we do things at Kula? We have solid, strong reasons for everything we do. Right now, myself or another instructor usually shares that “why” after something has happened—a door is locked, a charge is made, a hastily-worded message is sent via social media or email. I need to allow for others to understand our reasoning better, because it really does all make sense. IWhy does the door lock at the start of class? Can’t you keep the door unlocked if you think a student is running late? The instructor locks the downstairs door when our studio clock reads the start time of class—not a minute before or after. If everyone preregistered is present upstairs, and there are still minutes to spare, we wait to see if anyone wants to do a last minute pop-in. When someone arrives after the door has been locked but insists that they’re “on time,” I can’t help but assume that their cellphone clock doesn’t match our studio clock—there’s probably a few minutes of discrepancy. We’re not all functioning under some universal clock. Just take a deep breath, and arrive a few minutes earlier next time. Please don’t convince yourself that we started early. I promise we didn’t. Our studios are small and located upstairs. We check students in downstairs, and simply cannot leave an entire retail space filled with two businesses’ products—not to mention all of our students’ belongings—unattended. That would be pretty silly and totally irresponsible on our end. We ensure students that their things are safe in the hallway cubbies while they practice. Considering the size of our studio spaces, walking in late—as well as leaving early—is very disruptive to the rest of the students. It’s important to consider the impact of your actions on others. In the words of George Costanza, “We live in a society, people!” Seinfeld, anyone? We begin every class, workshop, and event on time out of respect for those in attendance. We never start late, and we never run later than scheduled. Everyone’s—including the Kula team’s—time is valuable. It’s simply a respect thing, and it goes both ways. If you are signed up for something, we’re not giving your spot away, unless you’re not there at the start time. You reserve your spot, we wait for you, and we start at the time designated. If you’re not there when we start, you’re not entitled to a refund or a waived fee. You reserved a spot and didn’t show up or arrived after the start time. The most basic comparison I can think of is for a concert or festival. You wouldn’t purchase a ticket, show up late, and insist that the songs you missed get replayed for you or you want your money back. That’s not fair, and I doubt the thought would even cross your mind. How is your reservation to a yoga class or workshop any different? In the end, I guess it all comes down to a need to assume the best of one another. If you arrive late for a class, event, or workshop, know that we are not thinking less of you or judging you for not being present. We assume that something stopped you from arriving on time—that’s it. If anything, we think, “Bummer. That’s one less student to serve.” We don’t get pleasure out of you not being present. We want you at Kula—you’re why we’re open. Please assume the best of us. Even though it would be nice and save so much conflict time, we aren’t all functioning under some universal clock, wherein all of our watches, phones, and clocks and linked up, all showing the exact same time. Kula teachers aren’t waiting by the door, watching their wrists, then turning the deadbolt the second the clock turns to the start of class time. We often look up and down the sidewalk before locking the door. We do have to begin our offerings when they’re scheduled to begin, regardless of your presence. It is out of respect for the students that were on time, waiting upstairs, not out of disrespect for you. If roles were reversed and you were waiting patiently for an offering to begin, you’d like and appreciate that we had clear boundaries about beginning on time. If you want to be at Kula Yoga, we want you here with us. If what we offer is not your jam, or our boundaries are too firm, that’s cool, too. If you are a member of our community, in any capacity, know that you’re valued and respected. We’ll keep working to hold the values of the studio community to a high standard out of consideration for each of you. Kula is offering a special event on Saturday nights! Our first R&R: Reiki and Relax is this Saturday evening. Led by Kula instructor and Reiki practitioner, Danea, R&R will be a powerful 75 minutes filled with mediation, binaural sound healing, selenite crystals, and individual energy healing. Participants will consciously slow down and give themselves the gift of sacred rest. Read more to learn what exactly Reiki energy therapy is, what to expect from a night of R&R, and why this type of rest is so important to make time for. Originating in Japan, Reiki is a form of energy healing that works with “universal life force energy,” often referred to as Chi, Ki, or Prana. Simply put, Reiki is the energetic vibration of Love. Reiki energy is pulled through the energetic field of the practitioner, and it flows out of their palms and into the energetic field of the recipient. The person “giving” Reiki is just a vessel, as Reiki, like all energy, is intelligent and will go exactly where it needs to go, healing the individual wherever they need it the most. It is gentle and comforting and not affiliated with a specific religion or set of beliefs. During R&R, each student will receive a mini Reiki session, tailored to their specific needs, either for their mental energy, heart space, or for grounding and centering. Reiki feels like many things and nothing at all at the same time! Every experience with Reiki can feel different and will target different areas of healing. At times, one may simply gain an increased sense of peace and calm. Other times, physical sensations such as warmth, slight pressure, or a cool breeze can be felt. Receivers may experience a rise of emotion. Any thoughts, feelings, and sensations that come are normal and just a tangible sign of energy becoming unstuck and released, which is GREAT! There are no expectations for your mediation practice at R&R. Come as you are, mediation newbie or seasoned practitioner. Meditation often seems like an intimidating or boring pastime. We have all heard how beneficial and necessary mediation is to our overall health, but HOW does one even begin? In a society that creates bite-sized media bits for short attention spans, where we can refresh any page and be rewarded with more imagery to consume, how can we sit still and clear our heads for minutes at a time? Meditation can be challenging, especially at first. There is a misconception that those who meditate always get their minds “blank.” This is not true and leads many to think they “can’t” meditate or are bad at it. Understand that one cannot expect their mind to be completely empty, but they can direct their thoughts to focus on something that serves them. During R&R, participants will be practice “self-guided mediation.” This means that there will not be a voice or track to follow along with, leaving the mediation time in students’ hands. I will introduce a few options for mediation, and if one resonates with you, you are welcome to use it as your personal guide or intention throughout the evening. During R&R, students will be given the opportunity to use selenite palm stones and wands, as well as smaller crystals. Awareness can be brought to the stones during meditation, feeling their pressure, focusing on their vibration and healing properties, and noticing shifts in the body and energetic field. In today’s world, every one of us is pressured in countless ways to DO, to ACHIEVE, to EARN, to GET, to KEEP GOING and to NEVER-STOP-OR-REST-OR-TAKE-A-BREAK-OR-SLOW-DOWN. Ever. Often tied to this pressure are feelings of guilt and shame for needing to slow down. We feel like we aren’t doing enough if we need a nap, a day off, or even to sit down and have a meal in quiet. Obviously this is untrue, so why do we get stuck in the pattern of “do-and-then-do-more?” We can look to our Central Nervous System for a large part of this answer. When you take time to return to your restful and relaxed state, you allow your nervous system to calm, your body to come back to its natural state of peace, and your mind to let go and heal. You are purposefully giving your spirit the big deep exhale that it needs. Meditation, energy healing, and time for stillness are all ways in which you can take care deep care of yourself. When experienced together, calm and healing become exponential. So set aside time to rest. Enter into a state of meditation, breathe deeply, and experience personalized energy healing, all in a cozy space set just for you with soft fairy lights circling your mat space. Use blankets, crystals, lavender eye pillows, and music chosen to facilitate healing and enhance your journey. There are no limits to what you can let go of and make space for, or to the peace, joy, and relaxation you are capable of experiencing. Give yourself this time of R&R. You'll notice a new class offering on the schedule beginning Sunday nights in December. I can’t wait to share the transformative practice of Yoga Nidra with you! Thanks to the teachings of Stephanie Lynn of Yen Yoga in Traverse City, I feel prepared to lead you through what I've found to be a deeply healing practice of self-reflection and intentional thought. Yoga Nidra is yogic sleep, or sleep while maintaining a state of awareness. It is a guided meditation practiced lying down in Savasana. When practiced consistently and correctly, Yoga Nidra can help to relieve muscular, energetic, emotional, and mental tension. Through Yoga Nidra, students can develop a skill set to not only relax on a physiological level, but also release outdated imprints in both conscious and subconscious mental programming. In other words, you'll be gently called to notice your habitual thought patterns, then shape them into healthier, more bliss-driven mentalities. To think that, through Yoga Nidra, we can learn to think more intentionally and work toward mastering our brain chemistry is incredibly empowering. During a Yoga Nidra class, the space will look similar to how it does during one of our Sound Baths. Students will dress in cozy clothes and socks, lie down on their mats, get all swaddled up in a blanket, and situate their eye pillows on their lids. This style is best practiced without a pillow or use of a bolster, so as to allow for the deepest breathing possible, but thin, light props are welcome for students' comfort. The music will be soft, and the studio will be lit only by candles. Students will begin class reclined and remain in Savasana throughout the practice. I'll guide the class through some general relaxation exercises. Everyone will set a Sankalpa, or resolve, before being guided through body mapping and breath awareness exercises. I'll then lead the room through intentional guided and symbolic imagery, and yogis will revisit their Sankalpas before returning to conscious awareness at the end of class. Life is about balance and honoring both the Yin and the Yang of all that we do and encounter. One cannot take only high-intensity Buti and heart-pumping Vinyasa every day, only to leave out the more restorative practices of Slow Flow and Yin, for example. All are valuable, because they keep us in a balanced state of living. Our western culture wants us to place a higher value on things and changes we can see much more than those shifts that are internal and less apparent to the naked eye, but change only truly begins when the root of an issue is worked with from within. In the words of Swami Satyananda Saraswati, founder of the Yoga Nidra practice, "Release of tension, relaxation, and peace of mind are the secrets of transformation. " Change and development come when we are aligned, authentic, and in our true natures. We were meant to be peaceful and easeful, not over active and constantly spinning. Yoga Nidra help to bring us back to our true state. I hope to see you on your mats for Yoga Nidra, Kula. We love Chelsea so much, we decided to ask her some questions for our Teacher Feature! Cozy up with a cup of tea or a glass of wine—it’s Friday, ya’ll!—and learn a little more about this special lady. Describe your start with yoga. Like others, I had the preconceived idea that yoga was "just stretching" and "boring.” It wasn't until I moved to Denver for a summer internship that I gave it a shot after learning that it may be helpful with my scoliosis (a curvature in my spine). I also wanted to try something different in my new city. After a few Vinyasa classes, I quickly found that I was wrong– the classes were fast-paced, physically challenging, and proved to have mental benefits, as well. I grew up with a very competitive mindset when it came to sports, which always led to frustration and never feeling "good enough.” I love that yoga is a non-competitive activity where you can grow at your own pace and set your own goals, while also being supportive of other yogis' achievements in their practices. After graduation, I moved to Chicago, where my yoga practice became a daily ritual. I loved being able to move around after sitting at my desk all day, and I noticed a significant release in my back pain and discomfort. What prompted you to enroll in Yoga Teacher Training? After about five years of integrating yoga into my life, it evolved and developed into a passion. I wanted to learn more and deepen my practice by participating in a yoga teacher training. I quit my job in Chicago, traveled Europe for a month, and promised myself the next place I moved to I would take the plunge and enroll in a program. An awesome new job landed me in Grand Rapids, where I proceeded to do some research on local programs. Many synchronicities in my life ended up leading me to Kula Yoga and Megan's teacher training. I used to be so terrified of public speaking, which was a big reservation that I had about teaching. Megan's training and Kula have provided me the confidence, encouragement, and a welcoming, community-based space to feel more than comfortable teaching in. I am excited to continue to grow and learn with my Kula family! What are your Vinyasa classes like? My favorite season is definitely SUMMER! I love being outside, whether it’s walking my Goldendoodle, Lou (@loudoodle…yes he has an Instagram), hiking, boating on a lake, reading a book while hammocking, enjoying a beer on a restaurant patio, the list goes on. Warm weather and sunshine make me the happiest. Catch Chelsea on the schedule on Thursday mornings and Friday nights! There are so many great things about the unlimited yoga membership at Kula! Let's take some time to highlight a handful of membership details that set us apart. First, it's the most affordable unlimited option in town. Our monthly membership rate averages out to most student rates offered around Grand Rapids. The Kula exception is that we make membership more affordable to EVERYONE, not just to college students. Second, there's no commitment. While we hope that members will remain members forever, we realize that people evolve and needs change. We only want people to practice at Kula when they WANT to be at Kula. That's why there's no hidden fee or minimum time commitment that yogis must sign away on to be members of our studio. You cancel when you want to. We ask that you give us a few days notice before your charge date to make sure the auto-charge doesn't happen, but you won't get hit with a crazy fee for cancelling your membership. That just makes sense to us, and it seems fair on both sides. Members get a discount on the many workshops and events that we pride ourselves on offering at Kula. A 25% discount on already well-priced learning opportunities that will deepen your practice, get you out of your box, and allow for opportunities to engage with your Omies? Yes, please. Open Studio hours will change each week, depending on what's happening at Kula during a given time frame. Hours will be announced via Instagram and Facebook each Monday morning--unless that Monday is a holiday--and you can always check at the studio to learn about each week's available times. Members, there's no need to preregister for Open Studio. Just show up with your mat within the designated time slots, and go with the flow. We'll be sure to announce any additional perks or changes at the start of each week. Any questions? Ask us at the studio or shoot us a message. Your membership each month really does mean the world to us, and we want you to feel the value that you're getting by being a member at Kula Yoga. I thought I'd take some time to communicate a few important things regarding our move to the Kula tribe. The last class at Kula Yoga on Division is happening tonight! If you'd like to join me for the final Vinyasa flow in our very first yoga home, come celebrate tonight at 6:00. The studio will be closed on July 4th and 5th. The first class held at our new Wealthy St. location will be the 12:15 Vinyasa with Karolina on Friday, July 6! Please read on to learn about some changes coming with the move. At Kula, students have always been asked and encouraged to preregister for classes via the free MindBody app or through the MindBody website (accessible from our Kula website under the "schedule" tab). In the new location, we have two small studios in which we can fit a limited number of students. To ensure you have a space in class, please register for class at least 3 hours before the start time via MindBody. If the system does not allow you to sign up for a class, that is an indication that the class is full. I suggest signing up for classes as early as possible. If you show up at the studio unregistered and the class is full, please know that we cannot squeeze anyone in. By all means, if the class has open spots, one will be yours. But being that the studios are located upstairs at the new building, the number of occupants permitted in each studio is firm and truly out of my hands, so a full class is just that. With the transition from one large studio (now) to two small studio spaces, there will be a 3-hour cancellation window scheduled to begin July 6. At our current location, students and members often sign up for classes and do not attend. Since we have space for 40 students at current Kula, this practice hasn't posed an issue. On Wealthy, however, our space accommodations are shifting. If a student signs up for class and does not show, they've now taken a space away from another student. Students who do not show for a class they've registered for will be charged a $14 late-cancel fee, which equates to the cost of a drop-in. If a student attempts to unregister for class after the 3-hour cancellation window, they will be prompted to contact the studio in order to complete early-cancellation. Cancelling within the 3-hour window brings about a $7 early-cancellation charge. Please make sure to arrive at least five minutes before the start of class time. At the five minute mark before class starts, the instructor will note which students registered are not present and fill their spots with any students waiting to get in to class. At the new location, teachers will check students in for class downstairs, then head upstairs to teach at the start of the scheduled class. Therefore, we can no longer accommodate the "5 minutes late" allowance we currently have. Please give yourself sufficient time to travel to Kula, park if you've driven, check-in, and get settled. As noted above, your spot can be given to another student if you are not checked-in before the five minute start time. Did you get through all of that?! Please reach out to me if you have any questions. Email me at kulagrandrapids@gmail.com, or just stop in at the studio. Our new address is 715 Wealthy St. I appreciate you moving through these shifts with us and understanding why these changes need to take place at our new spot. “I won't know all of the poses." As a yoga teacher, I constantly hear the above statements and questions from people who have yet to try a yoga class, or even from those interested in trying out a different style of yoga. While I can do everything in my power to reassure potential students that flexibility is not a prerequisite to taking class, that yoga is a journey and you're encouraged to move at your own pace, that you don't need to know all of the poses, and that class at Kula is so much more than stretching--I realize that sometimes people just need a little nudge to help them take the plunge and jump into something new and scary. I understand. Join me this Saturday at Kula Yoga for Set Your Foundation: An Intro to Yoga Workshop. During this workshop, I'll offer a laid back, safe space for new yogis to explore what Vinyasa yoga is all about. The environment will be welcoming and non-judgmental ( as always), and you will have the opportunity to learn the basics of a yoga class. You'll get an introduction to breath work and learn what it means to set an intention at the start of your practice. I'll spend time detailing foundational yoga poses, and we'll discuss how to incorporate props into your practice. To wrap things up, I'll guide you through a 30-minute Vinyasa flow. This mini-class will allow for you to practice all that you’ll learn throughout our time together. I'll even provide you with an outline, so that you can record what you learn on paper. If you are just returning to your mat after taking some time away, you may experience some of the same feelings a new-to-yoga student would. Join me on Saturday! No matter your experience level, we are here to support your growth. If yoga is already a part of your life, but you have a friend or family member who feels hesitant to come to class, attend this workshop with them. Nothing beats having someone by your side to support you. By the end of the workshop, you’ll see that this whole kula has your back! What are you waiting for? Join me this Saturday from 11-1. Roll out your mat, or use one of ours. Come experience all the good yoga can bring to your life. Now's the time to take the plunge. On Saturday, June 23, Megan and Mary will co-host a workshop at the studio during which you'll learn about and experience self-massage via myofascial release, or MFR. During MFR, a gentle, sustained pressure is applied to points of restriction within your body's fascia, allowing the connective tissue to release and "unbunch" throughout your body. Specially-designed therapy balls are used to target those areas of tension. MFR, when performed correctly and consistently, can lead to reduced tension within the body, as well as increased mobility and range of motion. Think deep tissue massage--it hurts so good! Before we move forward, let's address the question on your minds--"What is fascia?" Physical therapist John F. Barnes describes fascia as "a specialized system of the body that has an appearance similar to a spider's web or a sweater. Fascia is very densely woven, covering every muscle, bone, nerve, artery, and vein, as well as, all of our internal organs including the heart, lungs, brain and spinal cord. The most interesting aspect of the fascial system is that it is not just a system of separate coverings. It is actually one continuous structure that exists from head to toe without interruption. In this way you can begin to see that each part of the entire body is connected to every other part by the fascia, like the yarn in a sweater." Since fascia is so ubiquitous within our bodies, it makes sense that restrictions or adhesions of our fascia create areas of tension, tightness, and those annoying "knots" that we always try to rub out with our hands. Restrictions within our fascial systems are inevitable. Daily stress leads to fascial damage, as does poor nutrition and lack of use. Scar tissue from old injuries build up tension within fascia, and emotional holding creates tightness within our physical bodies. That being said, your body's current state of being does not have to remain that way forever! Again, think back to that really good deep tissue massage with just the right amount of pressure. That very same, post-massage bliss can be obtained on your own through the practice of MFR, all in the comfort of your home and at no additional cost, other than the price of the therapy balls themselves. On June 23, Megan and Mary will teach you all about your fascia. You'll be given a pair of therapy balls to use and practice with, and there will be balls available for purchase after the workshop. Using the therapy tools, you'll learn different strategies and techniques for rolling out fascial tension in your feet, hamstrings, low back, shoulders, and neck. Wear tight-fitting clothing to ensure no fabric impedes on your fascia rolling. Come ready to learn and untangle your knots. Reach out to us with questions. We cannot wait to share our knowledge with our Kula. In this new age of self-care, self-love, and self-exploration, oracle and affirmation decks have been popping up all around us, each with their own unique imagery and themes. But what exactly are these mysterious and beautiful card decks used for? Oracle decks are most commonly confused with tarot decks, popularized by French mystics in the 1800s. Both are used as a divination tools, however oracle decks are less traditional in structure. They are typically designed around a theme or a deity and utilize your intuition to guide your interpretation of the card. The cards’ meanings are meant to be interpreted quickly and give advice. Affirmation decks, similar to oracle decks, are intended to give advice, but in a more positive manner that is “affirming”, inspirational, and motivational. They typically have a short sentence or statement written on each card that can be used as a mantra (“tool of the mind”). Pull one card from your deck to reflect on throughout the day. I prefer to do this when I wake up to set the tone for the day ahead. When you start your day off with a positive mindset, it will affect your attitude and those whom you interact with. You can even use that card as the focus surrounding your day and what you would like to accomplish. Leave cards out or hang them up if you draw one that you feel strongly connected to. It’s easy for us to forget– so use the cards to manifest the positive vibes that you felt when you first pulled it. Not to mention the imagery will make for gorgeous little art pieces when hung up. Using a card from an affirmation or oracle deck can be a powerful and helpful tool for meditation. Using the imagery as a focal point to stare at, or repeating the mantra written on the card will help you focus during your meditation practice, especially if your mind tends to wander. This is when your intuition really comes into play. If you have a big choice to make, or even a simple question to ask, you can use the deck as a device for self-guidance. Pull a card as you focus on a question, then reflect on how you interpret the card’s meaning, and how it is relatable to your life or question. Yes, once you get sucked in (and by sucked in, I mean, fall in love) with your first deck, you’ll want to keep buying more. The good thing is, there are SO many unique decks that tailor to different themes, types of artwork, etc., so that you’ll end up with a large variety in your collection– and always feel like you are noticing something new and beautiful about each card. Are you intrigued by oracle and affirmation decks, but don’t know where to start? Come to Kula Yoga for our Oracle and Affirmation Deck-Making Workshop on May 19 from 11-2pm to make your own beautifully unique deck that will be specific and special to YOU. We at Kula Yoga love to offer a wide variety of workshops and events at the studio--from Sounds Baths to dance workshops to mala-making classes. On April 14, we'll hold our first Manifestation Workshop, where we'll discuss the Law of Attraction, adorn ourselves with beautiful henna designs, and create our very own vision boards. Perhaps you are reading this and wondering what a vision board is. As an avid vision boarder--I make one with the start of each new season--I'd love to turn you on to the power of this aid. Simply put, a vision board is a physical tool used to help clarify and maintain focus on a specific life goal. You can display photographs, illustrations, words, and phrases that represent whatever you want to be, do, or have in your life. Think of a vision board as a visual reminder of your best life. You create it, display it, and allow it to shift your attention back to what matters to you. As human beings living in 2018, we're constantly bombarded with things that distract us from living the way we want to. From the moment we wake up, we're being fed messages that shift where we put our energy, what we value, and how we live--whether we realize this or not. Vision boarding help to squash that robotic cycle of subconscious consuming. 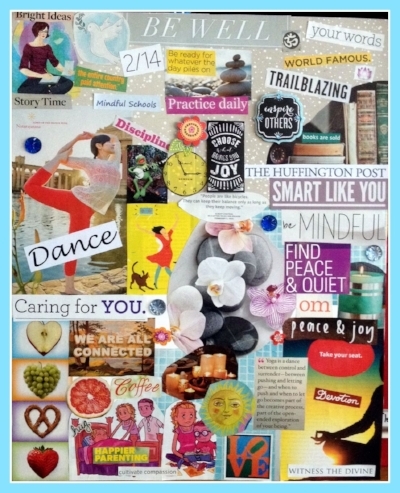 Vision boards allow you to take the power back by providing clarity, reinforcing affirmations, and focusing on intentions you hold close to your heart. I cherish the vision boarding ritual I've developed with each new season. To share, I choose a day in which I have a solid chunk of time to spend with myself. I set up my supplies, which include a fresh new poster board, a stack of old magazines, glue, and scissors. I meditate on what I want to manifest in my life over the course of the season. Once I've gotten clear on my intentions, I sip some tea, crank up some jams, and dig into that stack of mags. I cut out images and words that align with my goals, and I glue them thoughtfully to my board. Once I'm finished and my board is full, I place it in a prominent area of my home--somewhere I pass often so that I can see my vision board multiple times throughout each day. Each time I see that board, my mind is triggered. Manifestation magic! Join us at Kula on April 14 from 11-1pm. The ticket price includes all the supplies you need. My friend Amanda from Happy Henna will grace us with her presence and provide her beautiful, temporary body art to those participating. I'm confident that once you've created your first vision board and really tapped into the power of manifestation, you too will develop a regular practice around creating these visual tools. Reach out to the Kula team should you have any questions. As always, we're truly here for you. I look forward to seeing you at the workshop! Oh, how we fear that of which we know little about! When I recommend Yin classes to my students who regularly practice Vinyasa, Slow Flow, or Buti at Kula Yoga, they often ask what the style is all about, with a look of unease on their faces. Read and learn, my yogi friends. Yin Yoga is a style of yoga that was created in the late 1970's by Paulie Zink and later spread throughout the west by teachers and developers Paul Grilley and Sarah Powers. Yin, the opposite of "yang," is often described as a much more passive practice, especially when compared to Vinyasa. Don't let that fool you, though! There are challenges to be met on your mat during a Yin class. After all, living well is all about balance. Every yang actions needs a yin. There are three main principles of Yin yoga. These three basic guidelines can act as internal check-points for you to walk yourself through when in a Yin class. First, find your edge. Observe your body using an intensity scale, with "1" being feeling nothing and "10" being feeling pain in a pose. During a Yin class, you'd ideally hover around a "5" or "6" on the intensity scale. Turn all of your awareness to your body and how it feels. Second, be still. Once you realize you're in that sweet spot on your intensity scale, stay there. Resist the urge to fidget or contract your muscles. Instead, be soft. This is where props come in handy. Bolsters, blocks, and blankets can all help to fill the gaps between your body and the mat, making it much more comfortable to remain still in poses. Lastly, hold the pose. Yin asanas are help for an extended amount of time, generally for three to eight minutes. When you hold poses at your edge and are settled and still, you begin to create change in the joints, ligaments, tendons, and fascia of your body. Long holds offer the perfect opportunity to think of your intention for class and observe your breath. Do you want to increase or maintain flexibility and lubricate your joints? Do you desire to go deeper physically and emotionally on your mat? Are you ready to explore what lies beneath the surface of a pose? Are you ready to travel outside of your comfort zone? Do you want to balance out your strong, yang, Power Vinyasa practice? Then Yin is for you. Practice on Sunday nights with Karolina, Wednesday evenings with Erin, and Friday nights with Mary. I'll see you there! If you've been to Kula, you've heard someone, either your instructor or another student, mention Sound Baths. Sound Baths are held at the studio on the last Sunday of every month, and they've become a highlight of the many offerings at Kula Yoga. While sound immersion gatherings are all the rage in cities on the west coast, the healing events are not offered as frequently here in Michigan. I regularly attended a weekly Sound Bath at my home studio while living in Seattle--it was the perfect wind-down after a long and often depleting week in the classroom with my fourth graders. When I moved to Grand Rapids and noticed that none were offered to the public on a consistent basis, I decided I had to be the change. My focused studies began, I worked one-on-one with my Washington teachers to deepen my understanding of sound healing, took some accredited courses in sound therapy, and thus, Sound Baths at Kula Yoga came to be. Grand Rapids yogis have been buzzing ever since! Students have asked me every kind of question about attending a Sound Bath, from 'What do I wear?' to 'How do I participate' to 'Will there be bubbles?'. Let's take some time to learn about the value, purpose, and process of Sound Baths. We're constantly surrounded by stimulation, from the time our alarms wake us up, to the moment we close our Kindles and nod off at night. Our phones, the people around us, the computer--it's sensory overload all day long. Our minds and bodies crave a chance to get quiet and relax, now more than ever, and our senses need a break. Sound Baths are a chance to hit the reset button on your central nervous system. This holistic form of stress relief provides the space for you to truly "tune in" with yourself and experience healing through sound. When harmonious sounds are fluidly linked together, the result is a slowdown of your brainwaves, shifting from a more active state to a more relaxed and dreamlike one. I play a variety of instruments to set your mind and body at ease, including quartz crystal singing bowls, tribal drums, and chimes. Soft singing of Sanskrit mantra is often partnered with the musical vibrations. As the facilitator, I circulate the studio so that the sound echos from corner to corner, which provides a deeper sound experience for participants. We close our sound healing sessions with five minutes of silence, when we marinate in the buzz that seems to float in the air above our heavy bodies. Participants simply lie back, get cozy, and soak up the sounds. Many students wear pajamas and bring slippers to Sound Baths at Kula. Everyone sets their space up with a pillow from home and a blanket from the prop closet. Phones are off and conversation ceases for an entire hour. The studio is lit with the flicker of candles and the soft scent of Palo Santo wafts through the air. The time is magically restorative. Some students meditate, some doze off, and many let their minds wander in and out of dreams. Give yourself the gift of stillness and allow your body and mind to be surrounded by healing sound. Join us for our next Sound Bath at Kula Yoga. Check the schedule for the next offering, and preregister to reserve your spot. It's my true honor to provide the Grand Rapids community with healing vibrations. Thank you for the opportunity. Even if you're someone who's wholeheartedly determined to not make New Year's resolutions, you have to admit that there's a definite sense of "fresh start" that comes with the morning of January 1 each year. You've got the whole year ahead of you, and your slate is wiped clean! There's a lot to be said for the symbolism that a brand new year brings. The new beginning can also bring on self-reflection--What were some of your best moments of 2017? What would you have done differently throughout the past year? Who impacted you most? How did you impact others? How did you choose to spend your time? These are all fantastic questions to ask. It's never too late to look back and analyze your words, thoughts, reactions, and relationships. Oh, how easy it is to spend (waste) time getting caught up in what other people are doing and how amazing their lives are! Social media throws the awesomeness of our friends', friends of friends', and neighbors' day-to-days into our faces. It's often incredibly easy to forget that people are only showing the good stuff via their phones and computers. Instead of spending massive chunks of time throughout your precious days watching the overly-edited versions of what other people are choosing to show the world, why not start manifesting what you want out of your reality? Bring the focus back to you and what you want. Cultivating a deep sense of gratitude is one of the strongest, most powerful ways to bring positive, high-vibe energy into your reality. Slowing down and appreciating what you have is the key to happiness, because the more gratitude you feel and hold in your heart, the more abundance you'll bring to this life. How do I grow my gratitude, you ask? Below are three simple ways to surround yourself with a sense of gratitude. Once January 1 comes around, commit to incorporating one of the exercises into your day. If you're feeling like a real go-getter, try all three. Be prepared to notice a shift in your perspective. Morning gratitude list When you wake up, right after you silence the alarm on your phone, resist the urge to check your emails or Instagram. Be thoughtful about how you start your day! First thing in the morning is the perfect time to focus your energy in a positive direction. Instead of taking your attention outside of yourself, keep it internal, even for just a few moments. Set your phone down, take a deep breath, and think of three things you are grateful for. The first three things that pop into your head will work--my bed, my alarm, coffee. Take another deep breath, then go about your morning. Meditation Contrary to popular belief, one can meditate without being seated in Lotus Pose on a fancy cushion surrounded by candles and crystals! While that all sounds lovely, know that you can simply sit up in bed, still cozy in your blanket and pj's, and spend a few minutes breathing and focusing on one or all of the items from your morning gratitude list. Perhaps breathe in and say to yourself, "I am grateful for all of the abundance in my life." On your exhale breath, say, "Thank you." You'll be surprised at how grounded and peaceful you feel after only minutes of meditation. Vocalize your thanks At some point throughout your day, tell someone or something that you are grateful for them or it out loud. If a stranger holds the door open for you, express your gratitude. When your dog greets you with unbridled excitement upon your return home, verbalize your appreciation. Even if your candle smells especially fragrant one evening, say that you're grateful for it's scent. Actually say it. It might sound crazy, but there's energy in the thoughts we choose to articulate aloud with our words. Gratitude is like a muscle. The more you use it, the bigger it gets. Always remember that you have the power to shape your reality. What you choose to focus on is what you will surround yourself with, so make it good! Spend some time reading about what makes Ms. Karolina tick. Take her class on Wednesday mornings, Thursday evenings, and Fridays at noon and 4:30! You're sure to leave class with a smile on your face and more warmth in your heart. I love practicing yoga because no matter what is going on with me emotionally or physically, it allows me to drop into the practice and release my thoughts and worries. I feel like my mat is always a safe space for me to explore my breath,movement and mindfulness. I love teaching yoga for the exact same reasons. Whenever I have the honor of teaching a class, I feel like I get to hold and share space with the students. Everything else disappears and I love that students get the opportunity to come to their mat and release their day. My favorite pose is Chin Stand because it took practice and focus to achieve. I love practicing yoga for just that- the practice of it, and I believe in the sentiment that "practice makes practice, not perfect," I learned the layers of chin stand in an inversion workshop at Kula with Megan and have worked on it since. For years, I was working on floating one leg as I transitioned from high to low plank, but I never really understood to what I was building. As soon as I understood the layers of the pose, I felt equipped to try it, and now... I can do it! Of course, every day has been an adventure for me with Chin Stand. Some days I don't feel bold enough to press up, and other days it's just not there. Some days--I'm thinking of one class in particular with the lovely Mary Williams--my legs decided to run the show and kick up with such power that I was forced to back bend out of the pose and (not so gracefully) get out of it! I love that Chin Stand can be achieved in layers and that it is a pose that humbles me. Through my own personal practice and taking the opportunity to be a student, I learned the fundamentals of this pose and the why behind floating one leg in Chaturanga Dandasana- knowledge is power, friends! What would your perfect autumn weekend look like? - a hike with my partner and our little furry one, Eleanor, to see the leaves changing. I would love for this to be in northern Michigan, or somewhere out West, but good old GR is always nice, too! - make some delicious home-made food, like apple-pumpkin muffins ,or take on an adventurous dinner recipe--anything that makes our tiny home smell good! Thanks for sharing, Kar. You're a gem, and we're glad you're part of our Kula. Last week, the Kula community celebrated one year of yoga in Grand Rapids. What a year it was - so full of ups and downs. There were roller coaster highs and stagnant lows. I was frequently reminded of how life truly is all about taking the sour with the sweet. Things have a way of staying in balance. On a business level, Kula accomplished a lot in one year. The vision of Kula Yoga came to life while I was working as a full-time teacher at Burton Elementary in GRPS. I had lived in Grand Rapids for years and had still not found my yoga home. After thoughtful consideration, I decided to create what I felt was missing. I walked through the rectangle of bricks at 133 Division Avenue, decided to trust my intuition, follow my heart, and sign a lease. I brought on thoughtful, skilled teachers who are always pushing themselves to grow and care about community and connection as much as I do. I graduated two classes of instructors from the Megan Rader Yoga School. Kula brought BUTI Yoga (If you haven’t been, you’re missing out! ), chakra sound baths, mala making courses, and tribal dance workshops to Grand Rapids. We raised and donated hundreds of dollars to local community organizations with our weekly Outreach Flow. Most importantly, we stuck with the original mission of keeping things simple — simple space, affordable pricing, and a focus on connection — connection with the students, teachers, and community at large. Our Kula continues to grow, and I am humbled daily. With the highs come the lows, but I worked to see my challenges as my teachers. On a personal level, my relationship with my best friend and partner deepened over the year. Weeks after Kula opened, my husband and I lost our first baby, which left us heartbroken. Processing such a traumatic miscarriage--physically and emotionally--graced me with a much stronger, more immense respect for us women. Our bodies are literally the source of life and, though less frequently discussed, death. I've never felt such sorrow, all while surrounded by the newness and excitement of Kula. With the unconditional love and support of my family and close friends, I got out of bed. We women are powerful, and our resilience is unwavering. What an honor it is to be female. I knew that before. I feel that now. When I felt another cloud of sadness hover over me after the election, I stood in the rain for some time, allowing myself to feel the despair. Nevertheless, I persisted, as we women do. The ebb and flow of life will continue to meet me with ups and downs, and I will undoubtedly experience more highs and lows as I travel through this next journey. Things perceived as "good" and "bad" will come. I am choosing to push past doubt and fear, instead embracing growth and change. I am striving to live a life of love and abundance. Join me. Take some time out of your day to learn about the lovely Jenny Tanis. Catch her classes throughout the week at Kula Yoga. You can enjoy Jenny's guidance on Mondays at 12:15pm for Vinyasa, or take it easy with a Slow Flow on Sunday nights at 6:00. Without a doubt, Tree Pose (Vrksasana). I find myself standing in this posture while preparing dinner, waiting in line, or in casual conversations. Beyond that, I love how this asana is never the same for me. When I come to my mat hurried or during a hectic day, I am able to feel this imbalance during vrksasana and mindfully bring myself to a more peaceful space. On the contrary, some days I feel stable and strong...which is incredibly empowering. I am energized when I root down through my standing leg knowing that as I stand grounded, I enable myself to become open to new possibilities and reach higher and stronger. For me, Tree is an excellent example of how our physical yoga practice follows us off our mats into our relationships, jobs, and every day interactions. Eagle Pose (Garudasana). This is a total head thing. I struggle with the binding aspect of this pose. I rarely can wrap my free foot behind my standing leg or get my hands to connect. In this pose, I have to intentionally draw my attention back to my breath and find a mental space of non-judgement. I have to mindfully incorporate this asana into my classes to not deprive students from the incredible benefits of this pose merely because of my personal barriers. I choose to practice this pose because it gives me an opportunity to breathe through struggle, practice mindfulness, learn to be present, and hold myself and my body in a space of love and appreciation rather than judgement and criticism. I love providing a space for people to engage in self-discovery. Whether that is learning how to intuitively connect and listen to your body, or diving into the power of the mind-body connection. It is powerful to create a safe space where people trust you with their bodies and souls. It is humbling to be invited into the intimate experience of connecting with your self. It is an honor to connect with others through a shared love of breath and movement. We love you, Jenny! Kula Yoga is enriched by your presence. Here at Kula Yoga, we have a number of class types on the studio schedule. Kula yogis can choose from Yin, Slow Flow, BUTI, or Vinyasa, depending on where they'd like to take their practices on a given day. Students new to Kula Yoga, or even to yoga itself, often ask what the word 'Vinyasa' means. Awesome question--especially when Vinyasa class is offered at Kula sixteen times a week! Vinyasa can be defined as "breath and movement linked together." During a Vinyasa class at Kula, when you start to "flow with your breath," you're in the heart of Vinyasa. For example, imagine yourself moving through the flow of, "Inhale, Crescent Lunge, Anjaneyasana. Exhale, Revolved Crescent Twist, Parivrrta Anjaneyasana. Inhale, Warrior II, Virabhadrasana II. Exhale, Side Angle Pose, Utthita Parsvakonasana." That's Vinyasa. When your movement is linked with and guided by your breath, that's Vinyasa. It's almost as though you're dancing on your mat, and the music is your breath. Try taking the act of Vinyasa off of your mat. While you're sitting at your desk, inhale to slowly roll your head back, then exhale to draw your chin to your chest. Even as you stand in line somewhere, inhale, and grow tall through the crown of your head, then breathe out, and relax your shoulders down your back. These are easy ways to live your yoga outside of the physical space of Kula Yoga. These small actions taken off of your mat can bring you more awareness of your breath while you're on your mat, too. Inevitably, you'll be more mindful and at peace when you consciously breathe big, and that peaceful feeling will ripple around you to the people you encounter around Grand Rapids. Everything ties together, my friends. Buti Yoga is coming to Kula as of May 15! Imagine an hour-long class that combines yoga, tribal dance, and plyometric work-- a class that gets your heart pumping and your body spiraling to some amazing beats. That's Buti! Buti Yoga was founded by Bizzie Gold--a yogini, speaker and entrepreneur, ‘Buti’ is derived from an Indian Marathi word, and it translates to “the cure for something hidden or kept secret”. Buti Yoga fuses together various yoga asanas, tribal hip-shaking dance, and heartbeat-pumping plyometric bursts. Buti classes begin with a warm-up of breath work and poses that target various movements of your spine. The focus then shifts to internal core muscles and hip rotation isolations. You'll increase strength and unlock and increase your feminine energy. In the words of Lili Daniel, certified Buti Yoga instructor, "Our feminine energy is unleashed through moves that combine powerful warrior yoga poses with hip rotations and spirals, and the primal, tribal dance brings out your inner fieriness. These moves encourage everyone to be comfortable in their own skin and love themselves. The students within the class are considered to be a tribe — a tribe that moves together, and sweats together." You may find yourself giggling at your reflection during different points in class. Lighten up, and have a good time! Before you know it, you'll begin to embrace BUTI as real and powerful experience. It can be incredibly empowering to see what your body will do, along with the kind of community you'll build while practicing with others. We'll see you on your mats, Kula yogis!